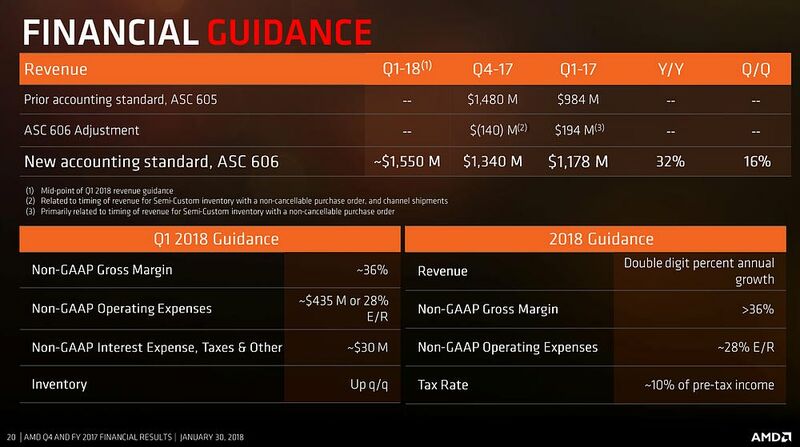 SANTA CLARA, Calif., Jan. 30, 2018 (GLOBE NEWSWIRE) -- AMD (NASDAQ:AMD) today announced revenue for the fourth quarter of 2017 of $1.48 billion, operating income of $82 million and net income of $61 million or diluted earnings per share of $0.06. 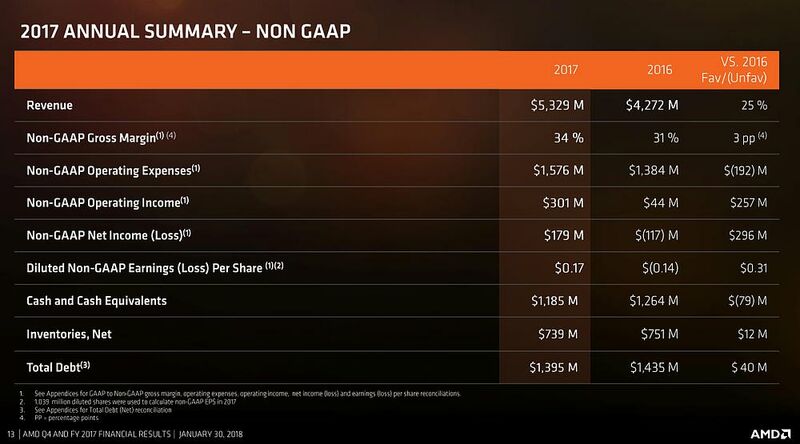 Non-GAAP(1) operating income was $103 million, non-GAAP(1) net income was $88 million and non-GAAP(1) diluted earnings per share was $0.08. ◦ Operating income was $85 million, compared to an operating loss of $21 million in Q4 2016 and operating income of $70 million in Q3 2017. 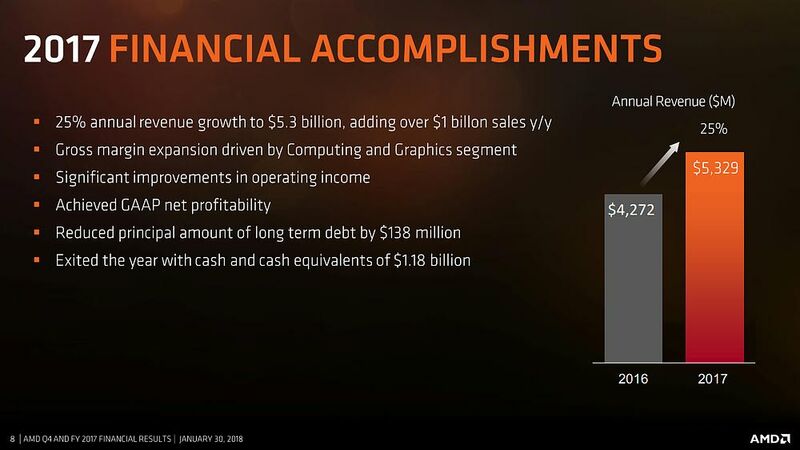 The year-over-year and sequential improvements were primarily driven by higher revenue. 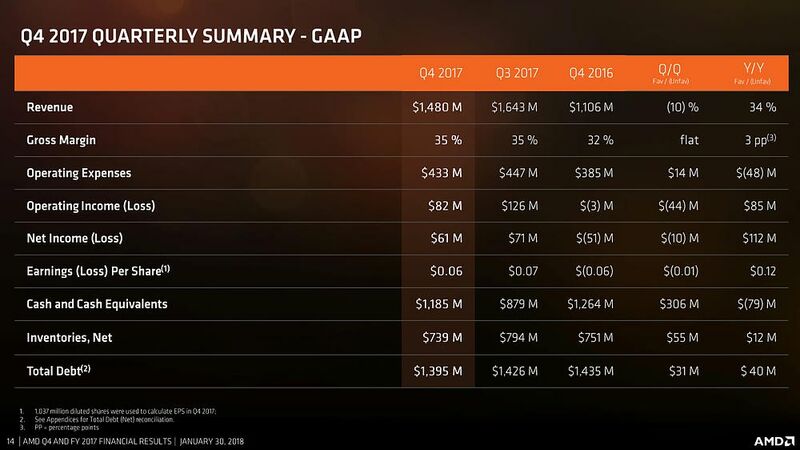 ◦ Client average selling price (ASP) was up year-over-year driven by higher Ryzen desktop processors ASP. Client ASP was flat sequentially. 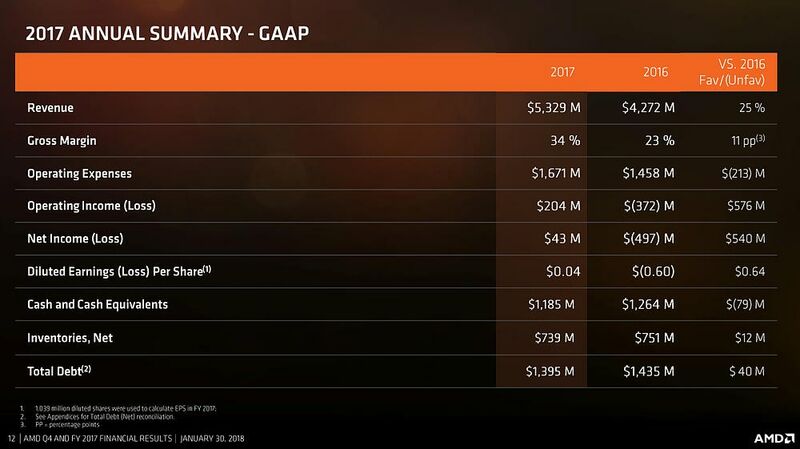 ◦ GPU ASP increased year-over-year and sequentially due to higher desktop and professional graphics ASP. 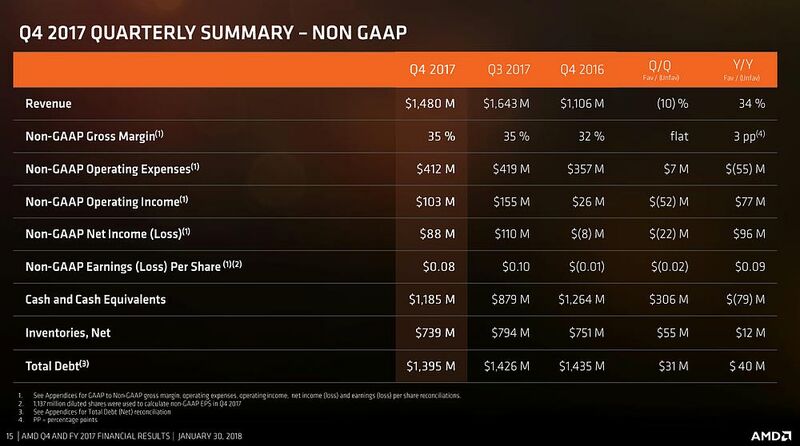 ◦ Operating income was $19 million compared to $47 million in Q4 2016 and $84 million in Q3 2017. 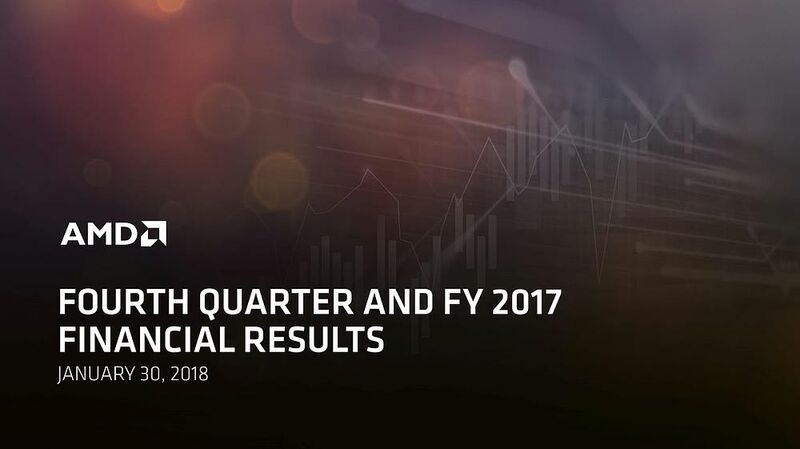 The year-over-year decrease was primarily due to the absence of a $31 million licensing gain in Q4 2016 and an increase in R&D expenses, partially offset by the benefit from a richer product mix. 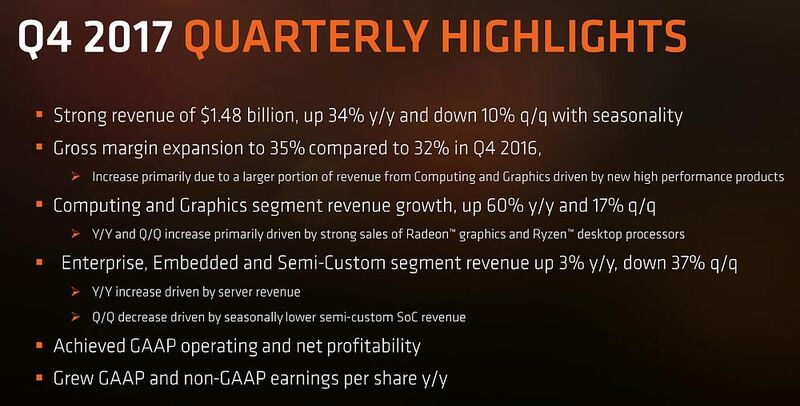 The sequential decrease was primarily due to seasonally lower semi-custom SoC revenue. 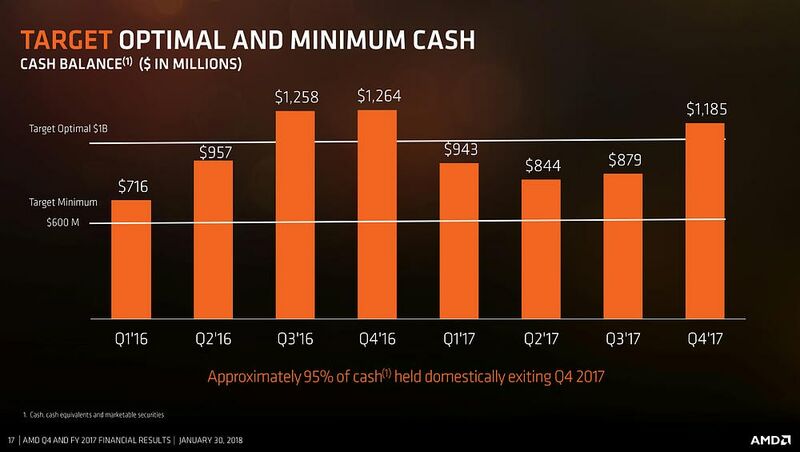 All Other operating loss was $22 million compared with operating losses of $29 million in Q4 2016 and $28 million in Q3 2017. The year-over-year and sequential improvement was primarily related to lower stock-based compensation charges in Q4 2017. 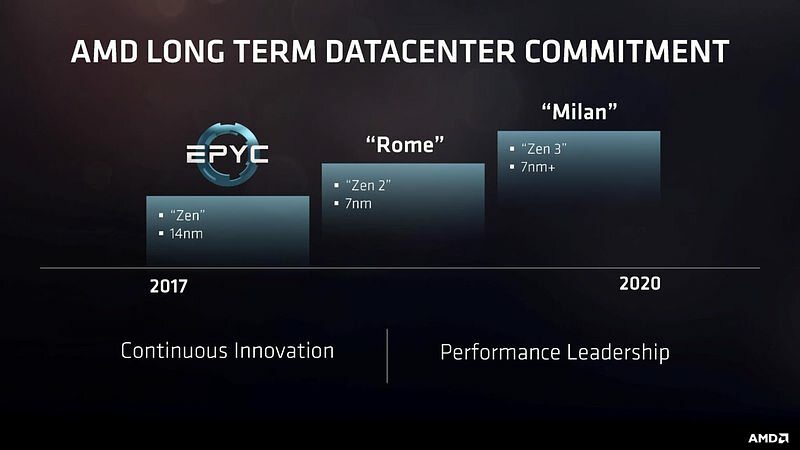 ◦ Microsoft Azure became the first global cloud provider to deploy AMD EPYC processors in its datacenters for its latest L-Series of Virtual Machines. ◦ Baidu deployed AMD EPYC single-socket platforms to power its AI, big data, and cloud computing datacenters. 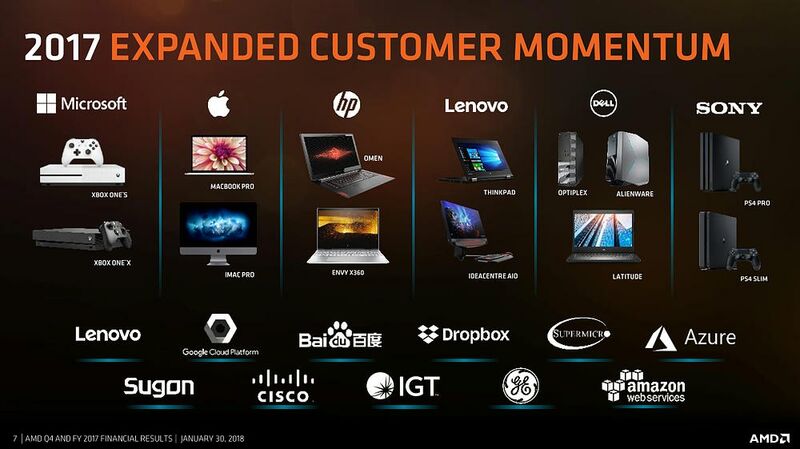 ◦ New high-performance platforms powered by AMD EPYC CPUs are now available from ecosystem partners including ASUS, GIGABYTE Technology, and Supermicro. ◦ The AMD EPYC processor-powered HPE ProLiant DL385 Gen10 server started shipping in volume in December 2017, which launched with record-setting SPEC CPU® performance and features leadership cost per virtual machine configurations. ◦ EPYC CPUs were recognized as the Linley Group Analysts’ Choice Awards “Best Server Processor” and in the “Top 5 Products or Technologies to Watch” category of both the HPCWire Readers’ Choice and Editors’ Choice Awards. 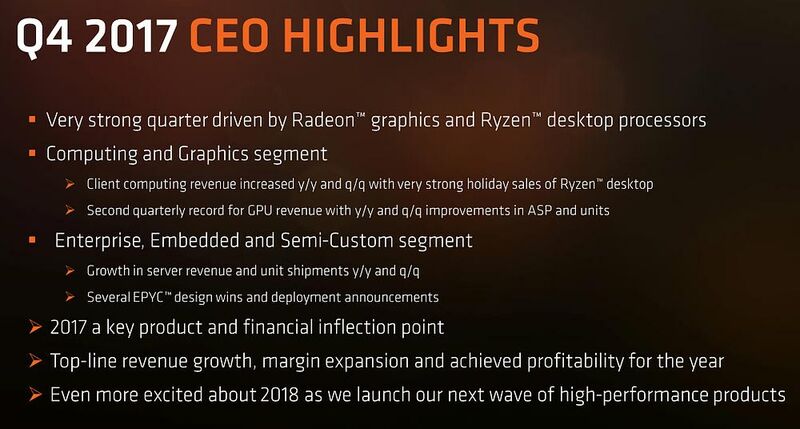 ◦ Combining the power of the “Zen” CPU and “Vega” GPU architectures, Ryzen mobile processors deliver up to 3x the CPU performance, up to 2.3x the GPU performance, and up to 58 percent less power consumption compared to the previous generation AMD notebook processors. 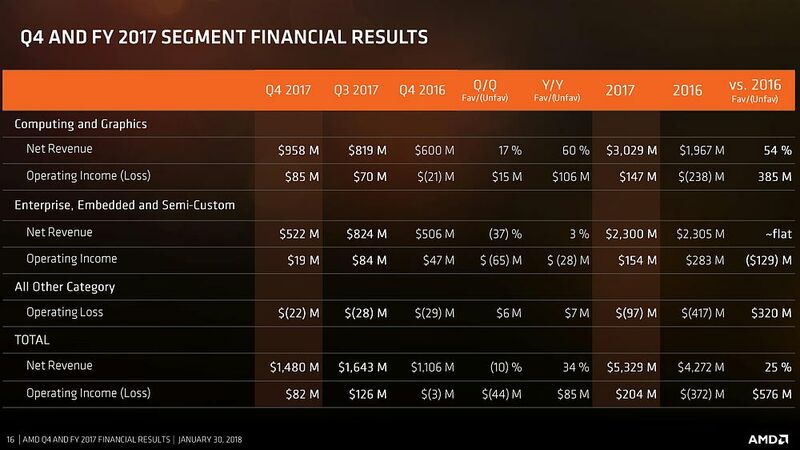 ◦ Ryzen mobile-based notebooks are currently available from Acer, HP, and Lenovo, with more systems expected from Dell and other OEMs in Q1 2018. 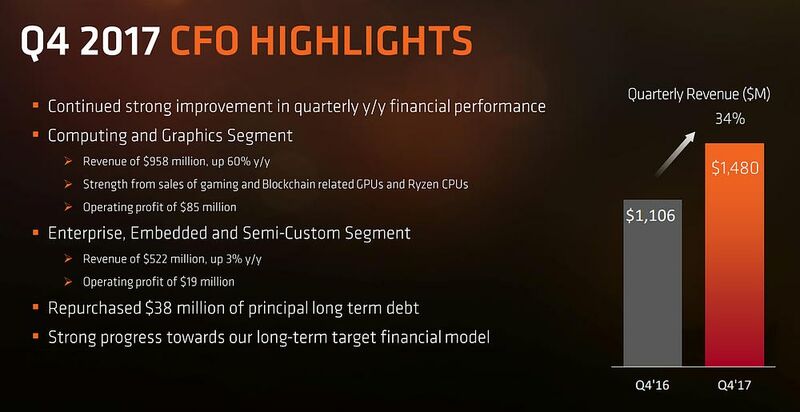 ◦ AMD and Qualcomm announced a collaboration to bring smooth and fast PC connectivity based on Qualcomm® Snapdragon™ LTE modem solutions to high-performance AMD Ryzen mobile processors designed for consumer and enterprise notebooks. ◦ Apple launched its most powerful Mac ever, the iMac Pro featuring AMD Radeon Pro Vega graphics. 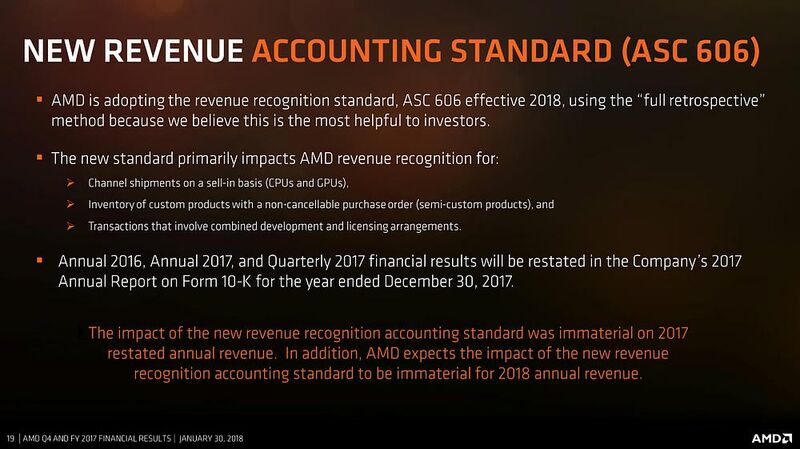 ◦ AMD designed a semi-custom GPU that will be integrated into the 8th Gen Intel® Core™ processor with Radeon RX Vega M Graphics. 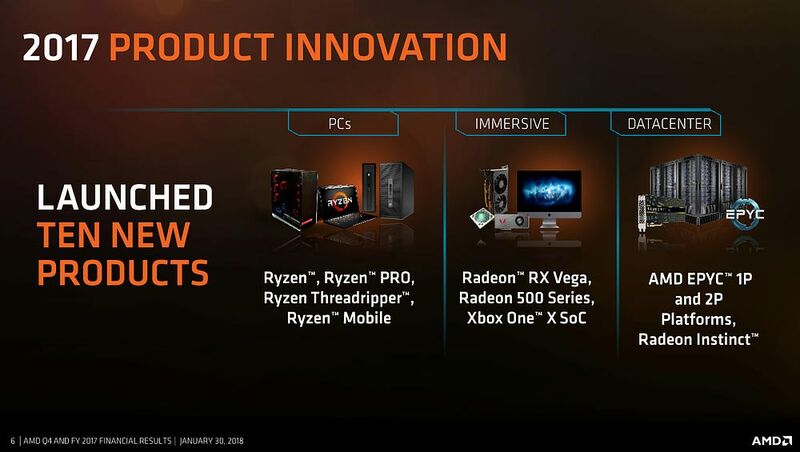 ◦ AMD announced the expansion of the “Vega” family with the Radeon Vega Mobile GPU for ultrathin notebooks.